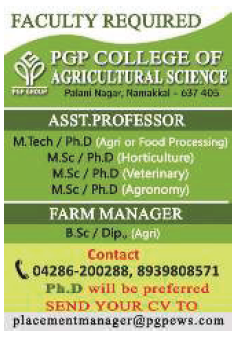 PGP College of Agricultural Sciences, Namakkal has advertised in THE HINDU for recruitment of Assistant Professor / Farm Manager jobs vacancies. Interested and eligible job aspirants are requested to apply as soon as possible from 08th July 2018. Check out further more details below. About College: The PGP COLLEGE OF AGRICLUTRAL SCIENCES, PALANI NAGAR, NAMAKKAL was founded by Dr.Palani G.Periasamy, an NRI and Educationist turned entrepreneur, as a token of love and concern for the economic and intellectual growth of the youth of his native place. The establishment of the college fulfills his long cherished desire of providing access to high quality technical education to the aspiring youths of this area. The founder’s vision is to make this institution a center of academic excellence in the areas of Agriculture and to transmit moral values, with focus on the development of rural people.